Do you want to earn money faster from blogging ? then you are at right place. So far I have created many posts about earning money from blogging like adhitz, infolinks, revenue hits, chitika and affiliate networks but today I am going to tell you about propeller ads which is a faster way to earn money. Its one of the best way to earn faster from blogging with only one disadvantage and that is its first minimum payout is $100 and after that you can payout if you reach $25. Don’t leave this network because of a higher payout rate. Just give it atleast a try and you will see that its easier to earn from propeller ads as compared to other ads and also you can reach this high threshold because of there great ads. 1. Accepts any site easily, no minimum traffic is required. 2. All ad sizes are available(square, rectangle, 800X600, 160X600 etc). 3. Payment methods include PayPal, Bank Wire, Payoneer Prepaid Mastercard ®, Payoneer Global Bank Transfer, ePayments, EPESE and Webmoney. 4. Higher revenue generating Mobile ad units are available. 5. Higher CPM(cost per 1000) – $3, $2, $1 minimum CPM rates. 6. 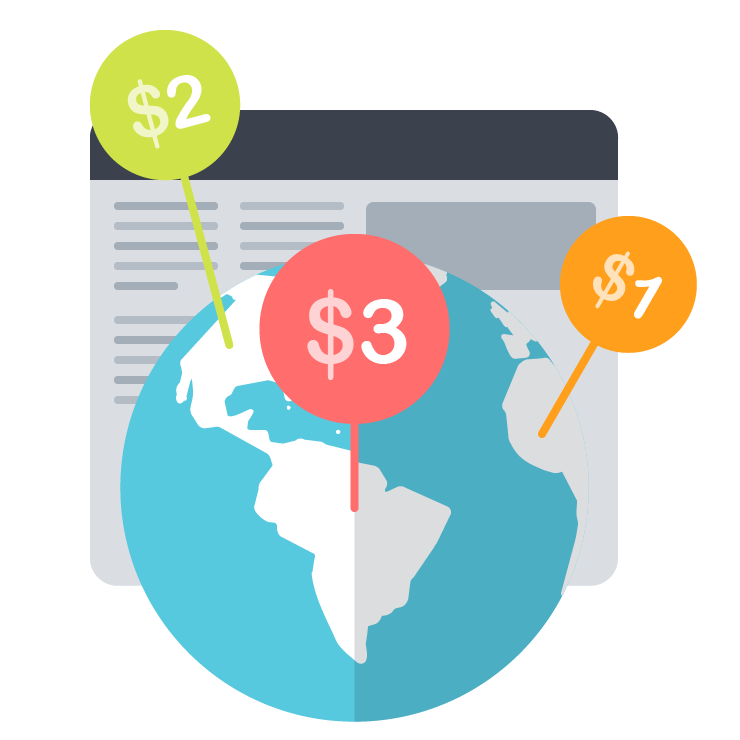 If you don’t have a blog or site you can still earn money with propeller ads using these native ad links, these links generate high revenues. So you can earn per view. 7. It is a pay per view ad network, its native ad links earn you per view. You can earn $0.20 to $0.50 per day with even low traffic. 8. Propeller ads referral program is really really good, you can earn $1 to $2 from 5 referrals per month. So more referrals equals to more money. 9. Ad units do not slow down your site, these are really optimized for faster performance. 10. Real time analytics of how your ad units are performing, updated every minute. 11. On-click / popup ads are also available and you can customize them to maintain your visitors experience while serving ads. You can allow 2 popups per visitor which means if you have 100 views per day your ad gets 200 views per day and that can generate you good rates depending on region of your traffic. 12. If you have videos on your blog or you have a blog only about videos then propeller ads can help you with it, they have video ads too. 13. You can use it with Google Adsense but don’t use pop-ups, you can use interstitial ads. 1. Minimum payout is $100 for the first payout and after that you can payout with a minimum threshold of $25. So these were the advantages and disadvantages of propeller ads. With only one disadvantage which is also for the first and last time, I consider this network good and recommend it. So if I am able to convince you then give it a try and share your experience with me by leaving a comment below. How To Earn Money From Propeller Ads ? Step 1: Sign up for a Propeller Ads account as publisher. Step 2: Go to your email and verify your account. Step 3: Login to your Propeller ads account. Step 4: Click on Sites in the menu on left side. Step 5: Click on + Add new site button. 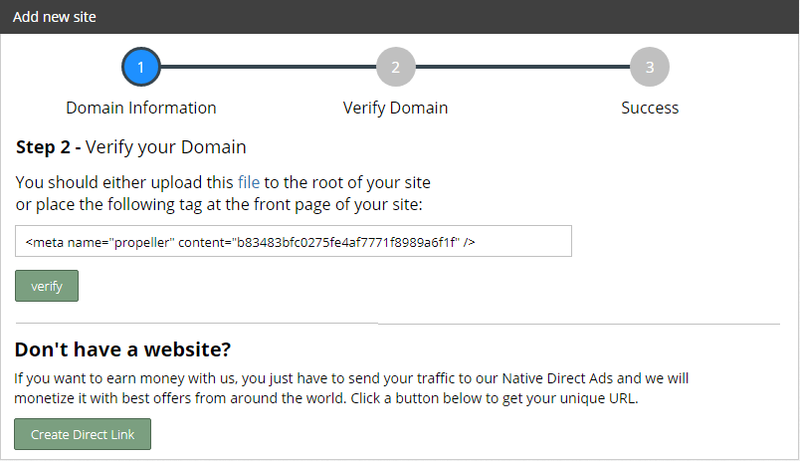 Step 7: Verify domain by copying the meta tag and paste it in your blog theme just after <head>. 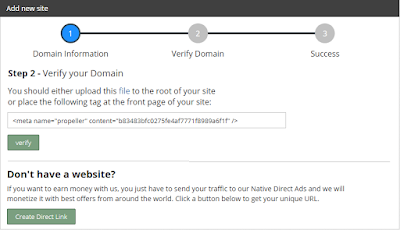 Step 8: Save your theme and go back to your propeller ads account and click on verify. Step 9: Once you verify your account you can make a banner. Step 11: Save and you are done. 2. Popup ads in blogs which do not have Adsense. 3. Mobile Interstitial and dialog ads. Use popup boxes in your blog with checkuout this offer buttons or fixed bars with buttons and use the native ads links, it will increase your earnings for sure. You can also use native ads links in posts, sidebars and anywhere where they can be visited. How To Use Propeller Ads To Earn Money From Facebook Page, Twitter Account Or Social Network ? Step 1: Go to propeller ads and login to your account or sign up and then login. Step 2: Click on sites and click on Add new channel. 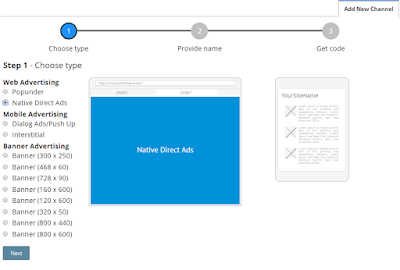 Step 3: Create a Native Direct Ad. Step 4: Copy the link and post it on your Facebook page, Tweet it Or share it on Instagram and earn money for every view. Propeller ads have recently added another very useful feature that is very unique and no other ad network has this ad feature. Its push ad notification which is very good for those who want to get benefit from mobile visitors. Mechanism is very simple, once you install the code of this ad unit, the ad show up in mbile view with 2 options i.e: Would you like to subscribe to updates with yes ans cancel options. If visitor click yes propeller ads will send ads as notification and you will earn for each click, CPM, per app install etc. 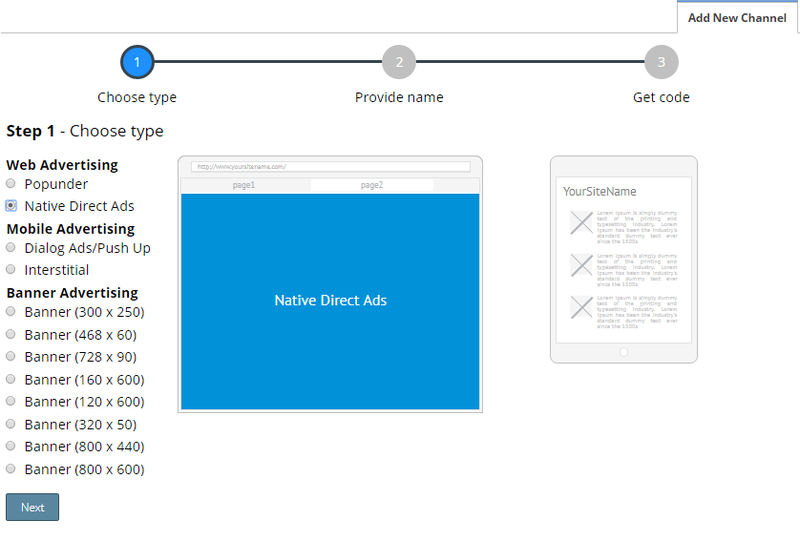 To get benefit of this new feature, go to propeller ads, sign in, generate this ad unit and copy the ad tag. Put it in your mobile site and start earning more. More subscribers = More ads serving = More revenue.